Genuine Lotus Air Filter - Rover K Series Engine. Part Number A111E6022S ..
Genuine MG Rover Air Filter - Rover K Series Engine. Part Number PHE100421 ..
Continental Cam Belt Kit To Suit Rover K Series Non VVC Engine Series 1 & 2. Includes: Be..
Continental Cam Belt Kit To Suit Rover K Series VVC Engine Series 1 & 2. 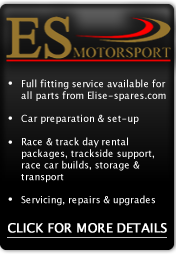 Includes: 1 x Ca..
Rover K Series Cam belt tensioner. Automatic type to suit non VVC engines. ..
Rover K Series Cam belt tensioner. Manual type to suit VVC engines. ..
Camshaft Oil Seal Front. Colour: Black. Manufacturer: Corteco. We use these on all ou..
Camshaft Oil Seal Rear. Colour: Red. Manufacturer: Corteco. We use these on all our E..
Con rod bearing set for any Lotus Elise or Exige with the Rover K series engine. High Quality.. Crankshaft pulley to suit all Rover engined cars S1 or S2. Only weighs 350g opposed to 1400g ..
Cylinder Head Coolant Outlet Gasket - Rover K Series Engine. OEM Quality Lotus Part Numbe..
Dipstick Tube to Cylinder Block gasket. OEM Quality Lotus Part Number A111E6009F &nbs..
Drive belt for alternator & water pump to suit the Lotus Elise 111S with Air Conditioning. ..
Drive belt for alternator & water pump to suit the Lotus Elise 111S with Lightweight Alloy Cr..